The 15 metre Ocean Dawn owned by Alan Browne from Fenit, Co. Kerry arrived at Mooney’s Boatyard on the 17th of November after it received extensive damage when it was squeezed between the rudder skeg of a large cargo vessel and Fenit pier a few days earlier. 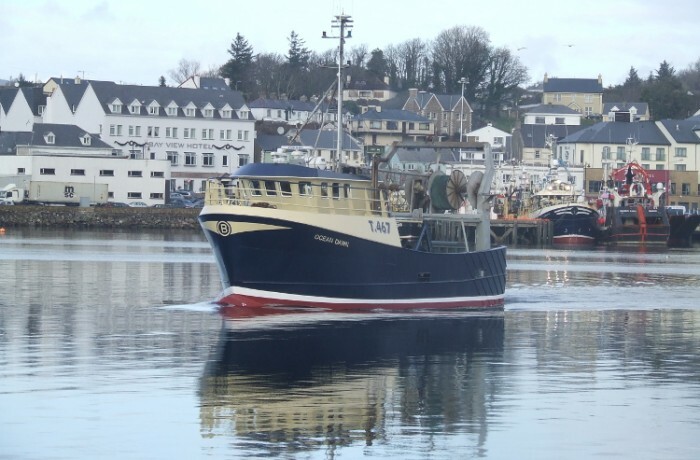 On its arrival in Killybegs, Mooney Boats Ltd put the Mfv Ocean Dawn up on the Synchrolift the following day and began the repair work immediately. The vessel was power washed externally before being taken indoors to begin the repairs works. The incident with the cargo vessel caused major damage to the bow section on both port & starboard sides of the Ocean Dawn between frames 14 and 24. The first job the yard done was to open the diesel tanks in engine room and remove all diesel from tanks and degas the tanks before any hot works begin. As all the damage was on the forward section of the vessel it meant the vessels forward cabins had to be stripped back to the bare steel completely and all bunks and fittings removed. On the starboard side there was also steel damage below the water line in the engine room and the yard had to remove equipment and machinery which included the removal of the hydraulic oil tank, steering system reservoir tank, hot water pressure cylinder, hot water tank, ships side valves and other pipe-work. Once everything was removed and safe the yard set up scaffolding around the vessel and began to cut away the damaged steel work on both sides of the hull including frames. The main area of damage was just above the main deck both pt & stb and also the aluminium shelter between Frame 14 – 24. On the starboard the vessel was also damaged below the waterline down into the engine room and this steel work was also removed. Once all damaged steel and aluminium was removed the yard fabricators fitted the new steel frames and aluminium frames and welded into position. The yard then made templates of the new steel sheeting required and cut them to shape on there CNC Plasma and also rolled and bent the sheeting in the fabrication shop to shape before bringing to the vessel to be fitted. Once all steel and aluminium fabrication was completed the yards welders moved in to complete all the welding on the vessel. While the Mfv Ocean Dawn was at the boat yard, its owner Alan Browne used the opportunity to get a number of other repairs carried out on the vessel, these included removing the rudder from the vessel where the yard extended the rudder on the forward side by 100mm over its height and they yard also fitted a 100mm angle Iron on the back of the rudder over its height. This resulted in giving the vessel a much more responsive steering system. The yard also removed the top rudder shaft and made repairs to it and manufactured and fitted new top and btm rudder bushings. The yard also supplied and fitted a complete new set Mg Duff anodes on the vessel. After the Christmas Holidays Mooney Boats Ltd carpenters moved in and began the extensive works in the forward cabin area which was totally gutted. Rockwool insulation was fitted on all the exposed steel works in the cabin area and Mooney Boats carpenters then lined the cabins with oak Laminated plywood. All exposed edges were slipped with solid white oak timber and skirting. The yard also redesign the internal layout of the cabin to the owners requirements and manufactured and fitted new bunks, a table and seating area in the extremely well finished accommodation area. While in the yard the vessel owner Alan Browne decided to refit the lighting system on the vessel with a LED lighting package which he purchased in Mooney Boats Ltd marine chandlery store. Mooney Boats Ltd who recently became sole distributors in Ireland for AAA Web Ltd lighting systems supplied the full range of external and internal LED lighting to Alan the vessel owner fitted himself which the vessel was been repaired. LED lighting is being seen by many in the fishing industry as the way forward, they are energy efficiency and have a life span up to 50 times that of incandescent bulbs and 5 times that of fluorescents. They are highly resistant to vibration and ideal for the marine industry. LED light is compatible with most systems and Mooney Boats Ltd now stock the full range in there Marine Chandlery store and will also be displaying the full range at Skipper Expo in Galway early March. During the repair works the Mfv Ocean Dawn was surveyed while the work was being carried out by the Irish Marine Survey office and also by Noel O’Regan of Promara Ltd who was working for the owner.